Over at the Chron blog, writes that IBM’s silicon integrated nanophotonics technology could be a pathway to Terabyte per second bandwidth and Exascale computing. Dense integration of optical circuits capable of transmitting and receiving at high data rates will solve the limitations of congested data traffic in current interconnects. 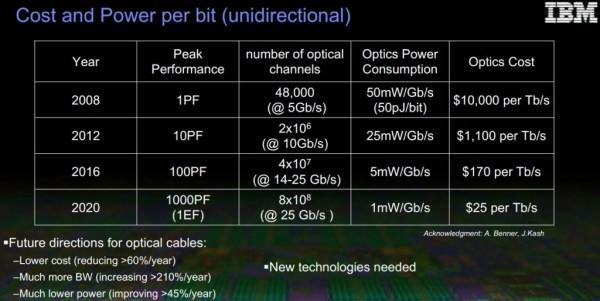 IBM’s CMOS nanophotonics technology demonstrates transceivers to exceed the 25Gbps data rate. In addition, the technology is capable of feeding a number of parallel optical data streams into a single fiber by utilizing compact on-chip wavelength-division multiplexing devices. The ability to multiplex large data streams at high data rates will allow future scaling of optical communications capable of delivering terabytes of data between distant parts of computer systems.